Helen R Durant of Point Fortin, Trinidad has passed away. 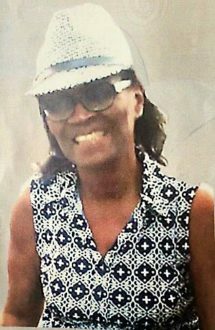 Point Fortin, Trinidad — Helen R. Durant, known to those who adored her as “Aunty Helena”, passed away peacefully on Sunday, March 31, 2019, at 9:34pm. She was born January 20, 1946 in Point Fortin, Trinidad to Pamella Rougier and James Phillip. Aunty Helena married Clifton Durant on June 13, 1979. They have two children, Shaquana and Bernadette, who she shared a very close bond with; and two grandchildren, Dasianae and Mrshelen, who she endlessly adored and showered with love. Aunty Helena worked as a baker and seamstress in Point Fortin for thirty years before following her family to the United States in 2015 for work, where her affinity for love and craftsmanship was consistently evident through the connections she formed with her customers on a daily basis. Aunty Helena truly lived life through simple pleasures; spending time with family, traveling, cooking, hosting, and caring for loved ones. Helena had an innate ability to touch a person’s soul through her quick witted remarks, boisterous laugh, and infectious smile. We will always lovingly remember our Aunty Helena. She joins her mother, Pamella; sister, Joan Aigle; and brother Morris Phillip, to walk along the scarlet shores. Helena is survived by her husband, Clifton; daughters Shaquana and Bernadette; grandchildren Dasianae and Mrshelen, son-in-laws Atiba and Jackson; brothers Henry and Miller Phillip; sisters, Elmena Rougier and Umelta Suitt; and many nieces, nephews and cousins. Following family tradition and as per her final request, Aunty Helena’s ashes will be scattered on Clifton Hill Beach in Point Fortin, Trinidad; on Tuesday April 9th following the ninth night of celebration.